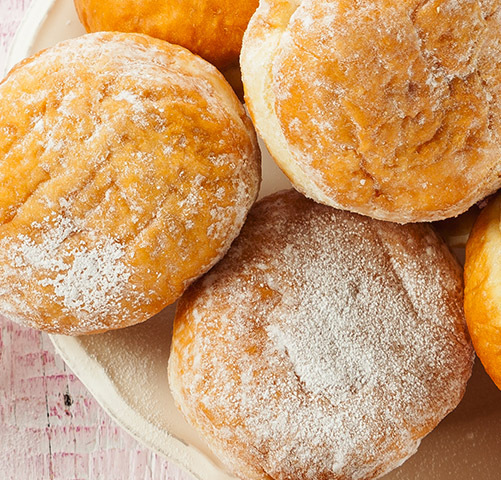 Sugared ball doughnuts, filled with mixed fruit jam. Bulk Packed and Frozen. Wheat Flour (Wheat Flour, Calcium Carbonate, Iron, Niacin, Thiamin), Water, Mixed Fruit Jam (15%) (Glucose Syrup, Sugar, Plum Purée, Apple Purée, Blackcurrant Purée, Concentrated Blackcurrant Juice, Concentrated Elderberry Juice, Acidity Regulators: Citric Acid, Trisodium Citrate; Gelling Agent: Pectin; Flavouring), Palm Oil, Sugar, Yeast, Dusting Sugar (1.3%) (Dextrose, Wheat Starch, Palm Oil, Flavouring), Egg, Glucose Syrup, Salt, Emulsifiers: Mono- and Diglycerides of Fatty Acids, Mono- and Diacetyl Tartaric Acid Esters of Mono- and Diglycerides of Fatty Acids; Raising Agents: Disodium Diphosphate, Sodium Bicarbonate, Calcium Phosphate, Flour Treatment Agent: Ascorbic Acid.